Nesher, Israel, NanoVibronix, a medical device company, announced that the US Food and Drug Administration (FDA) has granted 510K clearance to market PainShield™ MD, a diathermy device used to treat pain. PainShield is the first hands-free, patch-based device, thus allowing for an entirely new dimension in ultrasound treatment of pain and soft tissue healing. 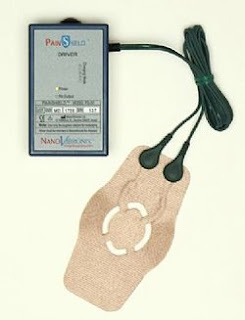 The PainShield consists of a disposable patch connected to a portable reusable driver and propagates therapeutic ultrasound waves to the desired area of the body. NanoVibronix President and CEO, Dr. Harold Jacob, stated, "PainShield MD, which implements our unique low frequency, low intensity ultrasound platform, is the first product from our pipeline to be cleared for marketing in the USA and represents a major milestone for NanoVibronix. NanoVibronix has created a platform that changes the way pain, the most common medical complaint, is managed. Our simple-to-use, portable device can treat pain locally including tendonitis, other musculoskeletal disorders, and post operative pain." Dr. HM Adahan, Head of Pain Rehabilitation Center at Tel Hashomer Hospital, Israel, commented, "The PainShield appears to present a simple, elegant, economical, and effective solution to many of the most painful and common ailments that I treat. It also encourages patient independence and reduces the costs of therapy by promoting clinician supervised home based care". Dr. Jonathan Rosenblum, Director, Diabetic Foot Service; Shaarei Zedek Medical Center, Jerusalem, Israel said, "My experience with PainShield MD has shown that it is highly effective in treating painful foot disorders including heel spur syndrome, tendon disease and wound pain." Dr. Rosenblum added "I am currently performing a clinical trial evaluating the effectiveness of PainShield on patients suffering from diabetic foot ulcers and initial results are very promising." "PainShield MD addresses many of the shortcomings of traditional therapeutic ultrasound and various other therapeutic modalities." NanoVibronix, located in Nesher Israel, develops products that implement its proprietary therapeutic ultrasound technology. The company has also developed a unique line of catheter based disposable ultrasound devices designed to treat catheter associated injury including pain, discomfort and biofilm formation. The first two products in this category are the UroShield™ for in-dwelling urinary catheters and NG-Shield™ for in-dwelling Nasogastric tubes.